posted: April 16, 2015 by: jt Tags: "Clinic Specials" "News"
The flea and tick season! Now that the weather has warmed up we are definitely starting to see more insect activity. If you haven't done so yet, break out the flea and tick products - whether you use a topical or the new chewable products, get your pet started right away. Also remember the heartworm prevention...we recommend using this all year round but for those of you that stop over the winter months, mosquitoes will be munching away on us any day now. 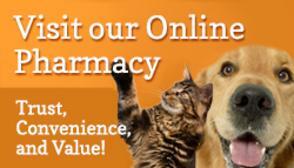 Feel free to stop by if you need more, or order from our online pharmacy!